employment | Asterisk, and other worldly endeavours. I’m really excited to be working with these guys, and to see what we’ll develop over the coming months! 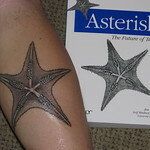 I’ll keep you informed here on my blog, and will continue to post Asterisk tidbits and snippets as I go.